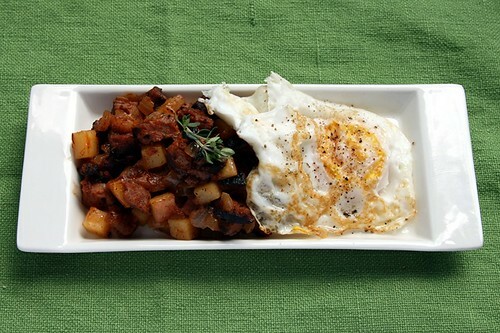 red potato and beef brisket hash with over-easy egg, originally uploaded by aarn! +10th May, 2010+. placed two diced red potatoes and a diced half of a yellow onion in a skillet over medium heat with a splash of olive oil and 1T. of butter. cooked slowly until the potatoes were almost fork tender. added 1/2c. of white wine, a splash of chicken stock, salt, pepper, and fresh thyme to the skillet and brought up to a light simmer. placed 1/2-lb of diced leftover sliced brisket on top of the simmering potatoes and onions in the stock and wine solution. covered and let steam until the brisket shredded easily. mixed all of the contents of the skillet together and simmered on slightly higher heat until the liquid had reduced. hit with a pad of butter and continued cooking until at the proper consistency. transferred the hash to a small plate and placed under the broiler until golden brown and crispy on top. served along side a fried over-easy egg. I wish I had seen this before I made breakfast this morning!